The UNP has responded to a statement issued by Five Media over remarks made by Opposition Leader Ranil Wickremesinghe at a recent media briefing with regard to ‘Daily Mirror’ newspaper. It also questions Five Media for having come up with an immediate statement to condemn Mr. Wickremesinghe’s answer to questions at the media briefing, while being disinterested in issuing a statement on the unethical media policy of the ‘Daily Mirror’ editor. Mr. Attanayake says, the UNP will keep watch on the steps Five Media would take with regard to the ‘Daily Mirror’ having published its statement without the references it has to the editor of the newspaper. Your five media organizations have issued a joint statement with regard to the answers given by Opposition Leader Ranil in response to questions posed by the ‘Daily Mirror’ journalist at the media briefing held in Colombo. On behalf of the UNP, I am making this clarification. At the above media briefing, Opposition Leader Ranil Wickremesinghe had only answered the questions posed by the ‘Daily Mirror’ journalist. Despite the claim in the joint statement by Five Media, the Opposition Leader had not shown any resentment while fielding the questions. Media organizations should have a clear understanding by now about the manner in which the lady editor of ‘Daily Mirror’ manages the national newspaper in accordance with her personal wishes. The most immediate case in point is that of the lady editor of ‘Daily Mirror’ publishing the joint statement issued by you after axing the references critical of her. Publishing a media statement after editing its content to suit one’s needs is a matter that questions media ethics. The UNP will keep a close tab on what practical action Five Media will take in that regard. This was not the first instance where the lady editor of ‘Daily Mirror’ had used the national newspaper to cater to her personal needs and wishes. Continued silence of Five Media when a national newspaper continues to be used for personal purposes is a matter that needs to be questioned. On a previous occasion, Five Media issued a statement on an alleged incident of the Opposition Leader having telephoned and reprimanded ‘Daily Mirror’ journalist Mr. Kelum Bandara. That statement had been issued without getting the Opposition Leader’s side of the storey. It has now been established that it was Mr. Kelum Bandara who had given the telephone call. To date, Five Media has not issued a statement to correct that false claim. I would like to bring to your attention the discussion Messrs. Sanath Balasuriya, Uvindu Kurukulasuriya and Poddala Jayantha – all of whom claim to represent media freedom of this country – had with the President at Temple Trees. At that meeting, the President had mentioned editors of certain newspapers by name and strongly criticised them, but Five Media has failed to issue any statement to condemning it. What had actually taken place was that the editors in question had been contacted at personal level and informed of the accusations that were leveled against them. I would also like to mention a news report posted in a website that the lady editor of ‘Daily Mirror’ had crossed her line and had advised the President on matters of diplomacy. Moments after that particular news report was posted, ‘Daily Mirror Online’ had quoted Free Media Movement’s Mr. Sunanda Deshapriya has having condemned the website’s claim. A few hours later, Mr. Sunanda Deshapriya said he had made no statement as mentioned in ‘Daily Mirror Online.’ The lady editor of ‘Daily Mirror’ who does not give space of her newspaper to statements of certain organizations including FMM, came up with a strong statement through her national newspaper. Even at that time, Five Media was not bold enough to issue a statement. When Messrs. Sanath Balasuriya and Poddala Jayantha requested a meeting with the lady editor of ‘Daily Mirror’, she had ordered that the two should not be allowed even to enter Wijeya Newspapers Ltd. premises. Even on that occasion Five Media did not issue a statement in haste. It is questionable that Five Media had come up with an immediate statement to condemn Opposition Leader Ranil Wickremesinghe’s answer to several questions at the media briefing, while being disinterested in issuing a statement on the unethical media policy of the ‘Daily Mirror’ editor. Learning from the past and taking into consideration the present incidents, it is clear whom the Sri Lanka Working Journalists’ Association, the Federation of Media Employees’ Trade Union, Sri Lanka Muslim Media Forum, Sri Lanka Tamil Media Alliance and Free Media Movement represent. I would like to remind you that the UNP and the people of this country are alert to the double-standards of Five Media which claims to represent media freedom of this country. Our organizations regret and condemn as unfitting of democratic political culture, the resentment shown by Opposition Leader Ranil Wickremesinghe to questions posed by the ‘Daily Mirror’ journalist at a media briefing on December 01st and his criticism of the editor of the newspaper. At that media briefing, when the ‘Daily Mirror’ journalist had questioned on the UNP’s plans at future elections, the opposition leader had said that the question should be posed to Kesara Abeywardena of ‘Daily Mirror’ and the editor of the newspaper. The opposition leader had also denounced an article by the deputy editor in which he had been described as a weak leader, and had asked the journalist to inform Kesara Abeywardena to come for a debate on the said article. Our media organizations believe that any media or media personnel has the right to express ideas through the media within the boundaries of the ethics of the profession. We consider it bad precedence that an important person like the Opposition Leader adopts a resentful approach towards such a right. The anti-democratic rejection of opposing views has come to take roots in Sri Lankan politics, and most politicians consider the media within that border. It is likely that any resentful criticism from any quarter would be considered by the media in a negative light at a time when there is serious repression of the media. Therefore, our organizations request all political leaders and movements to refrain from resentful responses and resolve their differences with the media in a more democratic manner. Our organizations would like to mention that we too, have reservations with regard to the conduct of the lady editor of ‘Daily Mirror’. It appears that there is personal influence on the reportage of the newspaper. Our organizations firmly believe that politicians as well as the media should use the media in a manner that earns confidence and respect of the target audience. Dec 03, 2008 (LBO) – An imprisoned Sri Lankan journalist, who faces a lengthy jail term for expressing his views, if convicted, has been nominated for a media freedom award by media watchdog Reporters Without Borders (RSF). Nobel Peace Prize winner Shirin Ebadi will present the prize to the winners on Thursday, December 04 in Paris. Tissainayagam has been detained since March 2008 and is the first journalist to be charged for his writing under Sri Lanka’s Prevention of Terrorism Act, a law described as draconian by human rights groups. The charges against him include promoting violence and bringing the government into disrepute in his writing between June 2006 and June 2007 in the North Eastern Monthly magazine. Five media collective express our disappointment on the attitude of intolerance and animosity displayed by Mr. Ranil Wickramasinghe towards a Daily Mirror reporter at a press conference held by UNP on 01st Dec 2008. . In our opinion this attitude is inconsistence with democratic morns and journalists’ rights. When a Daily Mirror reporter asked a question about the plans of UNP for upcoming elections Mr. Wikramasinghe’s response was to ask that question from his deputy editor and chief editor. Then Mr. Wikramasinghe went on to criticize Daily Mirror deputy editor for an opinion he has expressed in his weekly column saying that Mr. Wikramesinge is a week leader. Mr. Wikramasinhge asked the Daily Mirror reporter to tell his deputy editor Kesara Abewardana to come to next press conference to have debate on his opinion. Our organizations stand by any journalists’ or media institutions’ right to express their own ideas on public interest issues provided that they do not violate the accepted media ethics. Five media collective thinks that a negative attitude coming from a person hold an esteemed leader of the opposition position towards a reporter could be a wrong example for many others fellow. 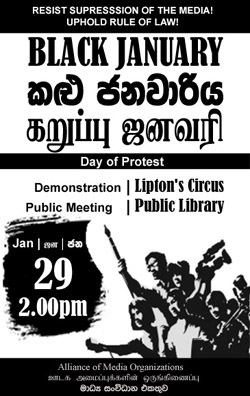 Intolerance of other opinions is a major issue in Sri Lankan politics as well as in our media culture. Today we live in a situation of unprecedented media suppression and intimidations. In such a situation any intolerance and animosity towards media and journalists could be perceived as a threat. We appeal all politicians to tolerate even offending questions by media and reporters and respond to them properly. Responding to reporters questions is respecting peoples’ right to information. If there are any issues go beyond we hope that all concerned parties will solve them democratically. Five media collective would like to express its displeasure over the way Daily Mirror editor has been censoring news according to her whims and fancies in recent times. In our view not only politicians but editors and media too have a duty to build credibility with relevant audiences by acting respectfully, adhering to accepted code of ethics. Media watchdogs in Sri Lanka have condemned threats to Daily Mirror by the leader of the opposition. President of Sri Lanka Working journalists Assosiation (SLWJA) Sananth Balasuriya told BBC Sandeshaya that opposition leader, Ranil Wickramasinghe, should withdraw his threatening remarks against the English language daily. The Five Media Collective has criticised Mr. Wickramsinghe’s remarks, in a press conference, on Daily Mirror’s editor and deputy editor on Monday. When a question was raised by the Daily Mirror correspondant at the press briefing the the United National Party (UNP) leader has come back saying “go and ask that question from your editor and deputy editor”. Daily Mirror Deputy Editor Kesara Abeywardena in a column he wrote has earlier described Ranil Wickremasinghe as “a weak leader”. “We would like to note that any such irritating remarks by any party at a time there is a strong oppression and censorship in the country,” the watchdogs said in a statement. The Five Media Collective called upon all political leaders and movements to prevent making such remarks on media. The watchdogs have also criticised the editor of Daily Mirror for not publishing certain news items ‘according to her own choice’. “We firmly believe that not only the politicians but also media should behave in a manner that will be respected by the public,” the statement said. Daily Mirror editor Champika Liyanaarachchi told BBC Sandeshaya that she completely deny the accusations. “We were criticised by all parties; government, opposition, TMVP, etc as Daily Mirror has been unbiased in its coverage. If we have been biased towards one party we will only get accusations from the other party,” Ms. Liyanaarachchi said. “Five Media Collective should also elaborate whether they are going to issue similar statements against other media institutions when any of them don’t cover a story,” she added. The Five Media Collective consists of SLWJA, Federation of Media Employees Trade Union (FMETU), Sri Lanka Muslim Media Forum (SLMMF), Sri Lanka Tamil Journalists Alliance (SLTJA) and Free Media Movement (FMM).